SERVICES personnel from HMS Gannet and RAF Prestwick have been awarded the Freedom of South Ayrshire at County Buildings in Ayr. This is the first time the honour has been since 1975, when the last living former Provosts of the Royal Burgh of Ayr were honoured. 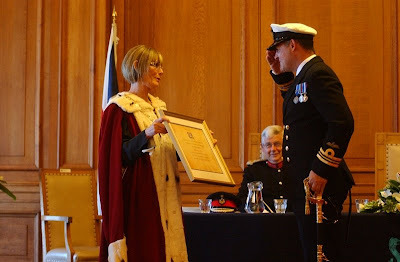 Accepting the Freedom on behalf of HMS Gannet, Lieutenant Commander Bryan Nicholas, said: “We feel great pride in being awarded the Freedom of South Ayrshire. “Not only are we based in Prestwick, but we try hard to get involved with the wider local community when we can and enjoy hosting local school groups, youth organisation and charities on site. Speaking on behalf of RAF Prestwick, Wing Commander Richard Connelly, Station Commander of Royal Air Force Prestwick, said: “The award of the Freedom of South Ayrshire is an enormous honour to all Royal Air Force Personnel past and present. “For over 70 years, personnel at Royal Air Force Prestwick have been proud of the contribution we make to the community in which we serve. 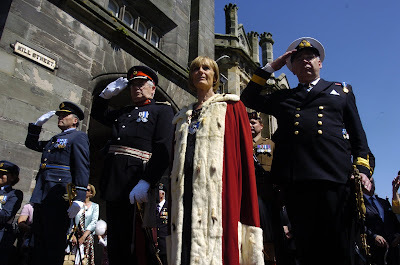 Both Commanding Officers then signed South Ayrshire Council's Freedom Roll, the first time that the Council, as a unitary authority, had bestowed the honour. The Freedom Roll was signed by South Ayrshire Council’s chief executive David Anderson, who said: “We have a long and proud association with our services and this honour comes exactly 50 years since the Royal Highland Fusiliers were awarded the Freedom of Ayr. Following the ceremony, the occasion was marked by a parade through Ayr Town Centre. HMS Gannet and RAF Prestwick were joined by B Company of the 6th Battalion, The Royal Regiment of Scotland and the parade of almost 200 services personnel was well received by hundreds of local residents, visitors and well wishers who lined the streets to applaud and cheer. Provost Winifred Sloan took the forces’ salute at Wallace Tower on Ayr High Street, which was marked by a combined forces flypast. The parade finished with a reception at Ayr Town Hall where Provost Sloan said: “A freedom ceremony is rarely awarded. None has taken place since 1975. “The honour is only bestowed on very special people and organisations, and I am delighted that we are honouring HMS Gannet and RAF Prestwick today. “The Freedom is a way of recognising what is contributed to communities. The day jobs of HMS Gannet and RAF Prestwick are challenging and they offer services which are much needed and appreciated. “Despite the rigours of their day to day work, time is still found to contribute through valuable voluntary, youth and charitable work. “Below the South Ayrshire Coat of Arms can be read the words Ne’er Forget the People. “HMS Gannet and RAF Prestwick epitomise that saying. There are currently 544 Ayrshire business stories permanently archived on this site. To locate those of most interest to you, please use the site search facility in the top left hand corner of this page. Type your search term in the white box, then click “SEARCH BLOG”.